“Untapped!” at the New Victory Theater. If a show’s success can be measured by the number of happily shrieking children in the audience, then “Untapped!” was a big hit on Friday night at the New Victory Theater. 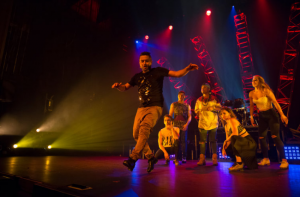 The perky percussive dance production, performed by the RAW Dance Company of Brisbane, Australia, brings together five tap dancers, a beatboxer and three musicians — on bass, guitar and drums — for one relentlessly energetic hour intent on engaging distractible minds. From left, Brianna Taylor, Jack Chambers and Sally Hare of Raw Dance Company in “Untapped!” at the New Victory Theater. None of the 18 numbers — which range from tapping in flip-flops to a flamenco-inspired duet — exceeds six minutes, and the performers pause more than once to find out how the audience is doing. That question was met with high-pitched cheers from the crowd of mostly children and parents on Friday, as were the dancers’ splits, headstands, back handsprings and other classic stunts. 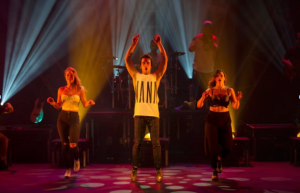 Choreographed by Andrew Fee, who founded RAW (formerly Raw Metal) in 1998, and Jack Chambers, an alumnus of Australia’s “So You Think You Can Dance” who also performs in the work, “Untapped!” sets out to amuse and stays in that key: the hard sell. By turns goofy and sassy — with the two women in the production, Sally Hare and Brianna Taylor, delivering most of the sass — it recycles the same dependably eye-catching devices in routine after routine. Rhythms are passed down a row from one pair of feet to the next; movement ricochets through a vertical column of bodies, from front to back. Is choreographic invention too much to expect from family entertainment? Vocal acrobatics sometimes upstaged physical ones, courtesy of the evening’s beatboxer, Genesis, whose voice is as agile — and as capable of multitasking — as the dancers’ feet. In the most giggle-inducing section, he provided the beats (from offstage) as the drummer Brendan Ramnath jammed on an invisible drum set. The night wouldn’t have been complete without a moment of audience participation, demonstrating that everyone has some “Untapped!” talent: a brief beatboxing lesson from Genesis for one brave young volunteer, who went home that night with a few new skills in her pocket. “Untapped!” continues through Feb. 21 at the New Victory Theater, 209 West 42nd Street, Manhattan; 646-223-3010, newvictory­.org.